Following after the MSN web portal redesign about two months ago, Microsoft recently rolled out the new MSN Mobile website. The new mobile site reflects the cleaner design of its non-mobile counterpart, and optimized for even faster loading on mobile devices. 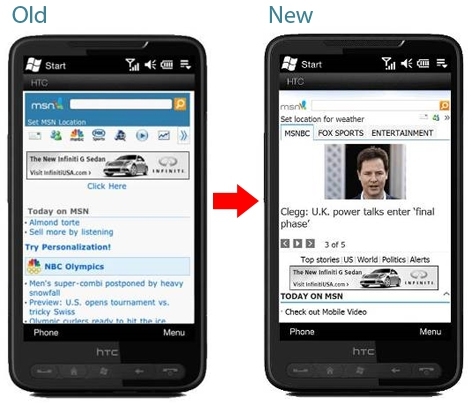 Some notable features include improved search and navigation, bigger photos, better social media and video integration. A full list of features and comparison screen shots are available on MSN's official blog page. To view the new site go to http://mobile.msn.com, and if you have a minute or two tell us your thoughts! Yay Microsoft, keep working on things that dont work on your own current mobile OS, dont worry your iphone clone OS will come from behind and take over the mobile world!! android and the iphone wont get any better by the time you launch, in fact, take a bit more time and launch in 2012, just in time to be wiped out by the mayan prophecy!! MS has promised new phones by holiday season, just forget to mention what year. You may be absolutely Right!